In central Europe is the economiest flight from January to April for 600 euro with Air France via Paris DDG + Orly to Guadeloupe , or with US Air via Philadelphia to St. Lucia. These are there the sunniest months and without cream and hat we are very soon red burnt. From Guadeloupe via Dominica and Martinique to St. Lucia is it about 250 km. The ship or ferry from "L´express des iles" or from "Caribbean ferries" needs 6 hours and return ticket costs 115 euro or us.dollars and the return ticket allows on each way 1 stop more days on Martinique or Dominica. So we can visit all 4 islands for 115 as G-D-SL-M-G and better not to plan any ship from Guadeloupe on weekend. But between the islands dont go ships daily. For example today we can not come from monday to wednesday to St. Lucia and we can not on wednesday and thursday leave St. lucia. But we can not reserve the ticket in travel office or on www.express-des-iles.com . We must buy the ticket there. In Pointe a Pitre can be on Saturday the ship from "L´express"to south full and we must take some tickets from "Caribbean" and some tickets from "L´express". And the all tickets cost G-D-M-SL-G = 55+55+55+80 = 245 euro or us.dollars. If we plan , how long we stay on each island , we must there change it , because the timetable via internet on www.express-des-iles.com is no more valid. And if is one day free , we can go with "Caribbean" from Pointe a Pitre at 8.00 to the little and nice islands Les Saintes and from there at 15.45 back, the ship needs 1 hour , goes daily and return ticket costs 35 euro , but we must see in the port of Pointe a Pitre the new timetable. 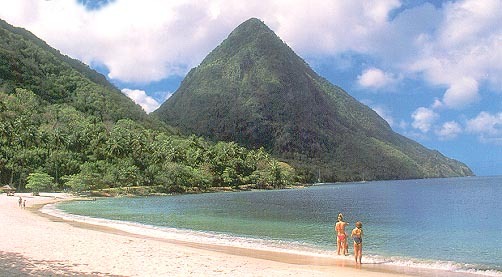 We can not find any ship from St. Lucia to St. Vincent or to north of Guadeloupe. If we fly in Paris to airport Ch.de Gaulle and continue from airport Orly , we must take in the airport the bus boarding pass , then is the bus free. Without bus boarding pass it costs 15 euro. The bus needs 30 min and we must have between arrival and departure in Paris at least 3 hours. If is the plane late and we wait our bagage , then are 3 hours in Paris not enough. In Paris bring better alone all baggages from CDG airport with bus to Orly , or your you baggage can arrive in Guadeloupe some days later than you !!! On Guadeloupe and Martinique we pay with euro. They speak french and only and only in the office of tourist information they know english and there we can get free maps of islands , cities and the list of hotels with prices , mostly all in french. Cars drive on the right side. On Dominica and St. Lucia we pay with east caribbean dollar , but mostly they will take also euro and us.dollar. They speak english and french and love reggae. Cars drive on the left side. De central Europa es el más economico vuelo a Guadalupe con Air France via Paris CDG + Orly por 600 euro de enero hasta abril , meses sin lluvia y sin viento. En Paris se va con bus del aeropuerto Ch.de Gaulle a Orly y entre llegada y salida se necesita 3 horas o más. Con "bus boarding pass" de taquilla en aeropuerto es el bus gratis , sin pass por 15 euro. Y toma solo mejor todas maletas de Paris CDG a Orly con bus o peuden llegar a Guadalupe algunos dias mas tarde que tu ! De Guadalupe a St. Lucia 250 km va la barca o ferry con 2 paradas 6 horas. El billete de Guadalupe a St. Lucia cuesta ida y vuelta 115 euro y en cada direccion se puede unavez suspender por algunos dias. Pues podemos comprar billetes G-D , D-SL , SL-M , M-G y visitar por solo 115 euro por turno Guadelupe , Dominica , St. Lucia , Martinique , Guadalupe. En www.express-des-iles.com el horario ya no vale y ademas los sabados pueden ser barcas de Guadalupe ya completamente llenas. Y asi tenemos que planear , cuales dias por cuales islas solo alli en puerto de Pointe a Pitre con nuevo horario.Y si tenemos un dia más , vamos a las 8.00 con Caribbean Ferries de P. a P. a las islas Les Saintes. Salida de Los Santos puede ser a las 15.45 y a las 17.00 estaremos en Pointe a Pitre. En Guadalupe y Martinique se paga con euro , hablan frances y sólo y solo en la informacion turistica se habla tambien ingles. Y allí dan nos gratis mapas y planos de isla y ciudad y la lista de hoteles con precios , todo es escrito en frances. Autos van al lado derecho. En Dominica y St. Lucia se paga con east caribbean dollar , pero toman también euro y us.dollar. Hablan ingles y frances y aman reggae. Autos van al lado izquierdo. Que lastima , no hay barcas de St. Lucia a St. Vincent. Von zentral Europa ist der gunstigste Flug nach Guadeloupe mit Air France uber Paris CDG + Orly fur 600 euro von Januar bis April , die sonnigsten Monate ohne Wind. In Paris fahren wir mit Bus vom Flughafen Ch.de Gaulle nach Orly und zwischen Ankunft und Abflug mussen 3 oder mehr Stunden sein. Mit "bus boarding pass" vom Schalter im Flughafen ist der Bus gratis und ohne "pass" fur 15 euro. In Paris nimmt man besser allein alle Gepackstucke von Paris CDG nach Orly mit bus , oder kann Gepack einige Tage später in Gaudeloupe ankommen als wir !!! Von Guadeloupe nach St. Lucia 250 km fahrt die Fahre mit zwei Stops 6 Stunden. Die Fahrkarte von Guadeloupe nach St. Lucia und zuruck kostet 115 euro und in jeder Richtung erlaubt eine Unterbrechung für einige Tage. So konnen wir Fahrkarten kaufen G-D , D-SL , SL-M , M-G und besuchen hintereinander Guadeloupe , Dominika , St. Lucie , Martinik , Guadeloupe fur 115 E. Auf www.express-des-iles.com der Fahrplan gult nicht mehr und auch samstags die Schiffe nach Suden von Guadeloupe konnen voll sein. Und deswegen welche Tage für welche Insel das müssen wir erst dort planen - im Hafen von Pointe a Pitre mit neuem Fahrplan. Und wenn ein Tag ubrig bleibt konnen wir um 8.00 mit Caribbean Ferries von Pointe a Pitre nach Les Saintes. Abfahrt von den Inseln Les Saintes ist etwa 15.45 und um 17.00 sind wir zuruck in P. a P. Auf Guadeloupe und Martinik zahlt man mit Euro , Spricht man franzosisch und nur und nur die touristische Information kann auch english. Und von der bekommen wir gratis Landkarten und Stadtplane und Verzeichnis von Hotels mit Preisen , alles auf franzosisch geschrieben. Autos fahren auf der rechten Strassenseite. Auf Dominica und St. Lucia zahlt man mit east caribbean dollar , aber man nimmt auch Euro und us.dollar. Man spricht dort englisch , franzosisch und liebt Reggae. Autos fahren auf der linken Strassenseite. Leider es fahren keine Schiffe von St. Lucia nach Suden nach St. Vincent. Ze stredni Evropy je nejlevnejsi let od ledna do dubna za asi 600 euro s Air France pres Pariz CDG a Orly na Guadeloupe a nebo s US Air pres Philadelphii na St. Lucia. To jsou tam take ty nejslunecnejsi mesice a clovek je za par hodin venku zle spalen bez kremu , klobouku , dlouhych rukavu , dlouhych kalhot , ponozek a nebo bez slunecniku. Z Guadeloupe pres Dominica a Martinique na St. Lucia je asi 250 km. Lod nebo ferry od "L´express des iles" nebo od "Caribbean ferries" pluje 6 hodin a zpatecni jizdenka stoji 115 euro. Ale neni mozno si rezervovati jednotlive plavby v cestovni kancelari nebo pres internet na www.express-des-iles.com , musíme si koupit jízdenky az tam osobne. V Pointe a Pitre se muze stati , ze v sobotu lod na jih od "L´express" je uz plna a tak musime vziti nekolik jizdenek od "Caribbean" a nekolik od "L´express". Pak uz to nestoji jen 115 euro , ale G-D-M-SL-G = 55+55+55+80 = 245 euro. Zpatecni jizdenka za 115 euro dovoluje kazdym smerem jen jedno preruseni na nekolik dni na Dominica nebo Martinique. Je tedy mozno za 115 E navstivit vsechny 4 ostrovy zpusobem G-D-SL-M-G a pro jistotu neplanovat plavbu z Guadeloupe o vykendu. Lodi nepluji ale kazdy den. Napriklad dnes nepluje zadna lod od pondeli do stredy na St. Lucia a zadna lod neopousti St. Lucia ve stredu a ctrvrtek. Jestlize si doma naplanujeme , kolik dni na kterem ostrove zustaneme , tak to tam musime zase predelati. Jizni rad v internetu uz neni platny na www.express-des-iles.com . Mame-li pak den navic , muzeme plouti z Pointe a Pitre v 8.00 na krasne male ostrovy Les Saintes a z nich v 15.45 zpet. Lod od "Caribbean" pluje hodinu , kazdy den , zpatecni jizdenka je za 35 euro. Novy jizdni rad nutno videt v pristavu Pointe a Pitre. Pristaneme-li v Parizi na letisti Ch.de Gaulle o odletame-li z Orly nebo naopak , musime si v letisti vziti "bus boarding pass" , pak je autobus mezi letistemi zdarma. Jinak za 15 euro. Autobus jede minimalne 30 minut a mezi priletem a odletem v Parizi musi byt alespon 3 hodiny. Ma-li vsak letadlo zpozdeni a ceka-li se na kufr , pak jsou 3 hodiny malo a dalsi letadlo se zmeska. A vsechna zavazadla je nutno prenesti si sam v autobuse z letiste Paris CDG na Orly jinak dorazi casto na Guadeloupe o nekolik dni pozdeji nez my !!! Na Guadeloupe a Martiniku se plati s euro a mluvi se francouzsky. Anglicky tam znaji jen a jen na turisticke informaci , kde nam daji zdarma mapy ostrovu a mest a seznam hotelu s cenami , vse je vetsinou jen francouzsky. Na Dominice a Sv. Lucii plati "east caribbean dollar" , ale vetsinou vezmou i euro a us.dollar. Mluvi tam anglicky a francouzsky. 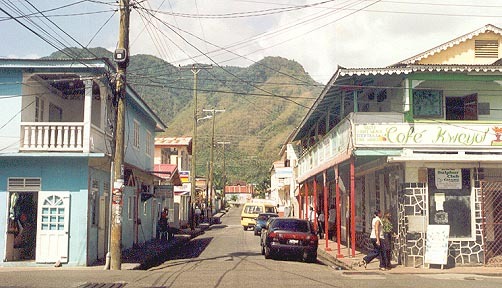 Auta jezdi po leve strane na ostrovech Dominica a St. Lucia. Vizum neni pro zadny z ostovu potreba. 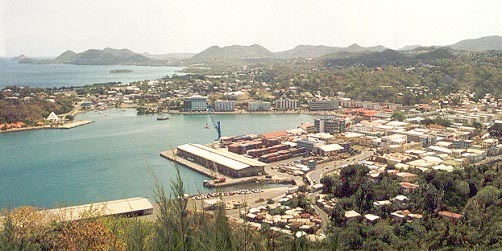 Ze St. Lucia na jih na St. Vincent , nebo z Guadeloupe na sever zadnou pravidelnou lod nenajdem.